On Domain Names, Size and Quality DOES Matter! What kind of impact will a domain name have on the success of the website hosted there? There are basically two schools of thought around the web. a) “The domain is not a big deal” school: those people argue that while a good domain can help on the success of a website, it is not an important factor, because people are increasingly using browser bookmarks and subscription tools like RSS feeds, removing the need for them to remember the name of the website that they want to visit. b) “The domain is vital” school: those people argue that despite bookmarks and RSS feeds, domains still play a very important role on the success of the websites built upon them. A good domain, therefore, can be the difference between a successful site and a flop. You can read more about that on the article The 7 Characteristics of Good Domain Names. I belong to the “domains are vital” school of thought, and I will tell you why, both with words and with numbers that I gathered on a small research. Bear in mind that whenever I mention “domain name” throughout this article, I am also referring to the name of the website itself. In the majority of the cases those are the same after all, and for marketing purposes they should always be. The biggest flaw on the argument of people that don’t think that domains play an important role on the success of websites lies on the assumption that web surfers will bookmark or subscribe to a given website right after visiting it. That is not the case. Most people need to come across a website several times before making the decision to bookmark it or to subscribe to its service. On the first visit they will come to that site via a link on another website or on a search engine. The domain name, however, will play an important role on the subsequent visits. If it is short, easy to remember and easy to spell, a visitor will not have a problem going back to that site in the future. If the domain is very long, hard to remember and hard to spell, however, there are great chances that the visitor will end up somewhere else, and will probably never return. Now I am not talking exclusively about users that will remember your domain and type it directly in their browser URL bar after a couple of days. If your domain is long, difficult to spell or contains dashers and numbers, there is a possibility that the user will completely forget about it. After two or three days he won’t even remember that your site exists. A short and catchy domain, on the other hand, will stick on the mind of the visitor. Even if he will not be able to type that, Google is there to help him find your website again. Another point to take into consideration is that connection between the domain name and the brand of a website. When you have dozens, if not hundreds of websites competing for the same niche, the brand factor will be determinant. If you then realize that the brand of any website is heavily anchored to its domain name, you can see how important domains become. I know that numbers and facts speak louder than words, so instead of extending my prose I will back up my claims with a small research that I did. Basically I gathered the top 250 most popular websites in the world (according to Alexa) and counted how many characters and words their domains had. I also checked if they had a .com or another extension (e.g., .net, .org, .info and so on). Notice that sites with a foreign extension were excluded from the list for the sake of simplicity. The results were pretty interesting. First of all, the average number of characters on the domain names was 7,15. 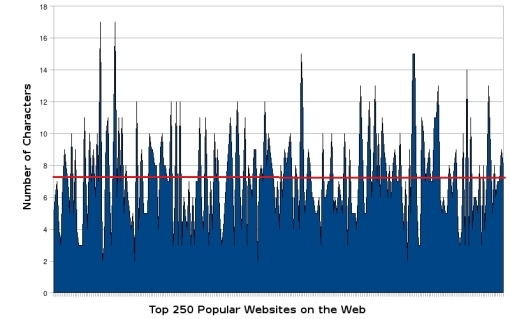 The graph below presents the number of characters on the y-axis, and all the 250 domains on the x-axis. The red line is the average (the statistical mean). One could say that the list with the 250 most popular sites in the world could be biased due to the presence service portals like search engines, email services, social networks and upload sites. I don’t think that the bias would be significant, but in order to remove the doubts I also profiled the domains of the last 250 websites that reached the front page of Digg. Those are mostly content websites, so they should complement the initial findings. The numbers here point into the same direction. The average number of characters on those domain names was 8,47. Slightly higher than on the previous case, but still a small number. The graph below illustrates that. Well, you just found an exception to the rule. It is like when you discuss smoking and health problems. Even if the statistics say that smoking will reduce your life expectancy by 20 years, there is always someone that has an uncle or a grand father that smoked his whole life and yet lived to the age of 100 years. Your uncle or grand father represents the exception, and in no way it diminishes the validity of the statistical findings. The same applies to the statistics we showed above, even if you know a popular website with a really long and weird domain. All other things being equal (e.g., marketing budget, content quality, design, affiliation with larger websites and so on), a website with a good domain name will always outperform a competitor with a bad or average domain name. Does this means that if you have a long or hard to remember domain you are doomed to fail? Not at all. But if you have a competitor on your niche that has a better domain, you will need to produce better content, offer a better service, or spend more money in promotion to compensate for that. Good article… what *really* matters is whether or not the domain name is an “exact match” — *precisely* the term that your target audience will most likely enter into whatever box they are entering what they want to find (be it “shoes” or “movies” or “appliances” or “domains” or whatever) — when I was a kid, there was this saying: “close only counts in horseshoes and hand grenades”. BTW: .COM is primarily for commerce / commercials, and a “round table” and a “roundtable” are two different things (so that — and the fact the English is not the only language on the planet — is the primary reason to prefer using hyphens for domain names with more than 1 word). All in all though, I am in agreement with you: too many people pay too little attention to content — and the *ONLY* content that *REALLY* matters is the domain name. @Karl, I think that local people trying to find a local website will try the local extension first. A Brazilian looking for a company called “super,” therefore, would type super.com.br. If you sell something to local market only, therefore, going with a local extension might be the preferred solution. @Namer.ca, if you want to target a local audience, like UK residents or Australian residents, then yes a local extension is the preferred one. If you want to tap on the global audience, however, .com is the way to go. although the one variable you mentioned that the domain has to be .com does not apply outside the U.S. for the most part since the local ccTLD in most countries is the .com. Really informative post. Good work. I think a good domain name will definitely give a head start, along with other factors like good SEO techniques. I think domain names should be catchy so that visitors will remember it easily. Also it should be easy to remember. Great statistics to back up your points. I have to agree with you that looking for short domains with a .com extension is the way to go. The problem I run into is finding them. Even if you want to pay sometimes it is really difficult. So at this point if you want a memorable, short, .com domain, you are going to have to get extremely creative or pay some big bucks. My domain name has 4 words and 20 letters in it. Try to forget it. How does the .com theory apply to sites outside of the U.S.? Would visitors in the U.K. first try .com or .co.uk for a company they’re looking for? I know here in New Zealand, the majority of people try a .co.nz before trying a .com. Generally, the idea that – if you’re a national brand then use your nation’s extension, or if you’re international use .com – holds well I think. This is a great post indeed. Personally, I think a domain name needs to be both informative and easy to remember. If someone can remember our domain name after just one glance, then we have an advantage over our competition. I am pretty sure there would be causation also, if you keep the other variables fixed as I mentioned. To be clear on what I meant by cause vs correlation, here is an example I once read. Students that sit in the front of the class tend to get good grades. This does not mean sitting up front is the cause of good grades. These students would probably get good grades no matter where they sat. So the best we can say is that sitting up front and getting good grades are correlated. So back to the point at hand, a domain name and its site’s success are correlated, but there is not necessarily any causation involved (though there could be – it would require experimentation). Great post. I’ll be sure to link to it from my blog when I write a future post on naming your startup for early entrepreneurs. Those were two separate points on the other article. @Rick, what you point out is an interesting point, but I still think we are talking about correlation here. In fact, if one could sample a large enough number of websites, say 100,000 websites, I am sure it would be possible to find a correlation between the size and quality of the domain and the success of the website. Of course there is a bias coming from the “cause” as you mentioned, meaning that web experienced people will inevitably be aware of this fact and they will tend to start projects on better domains than inexperienced people. But this bias should not render the correlation invalid. I like your analysis but be careful not to confuse cause and correlation. It’s possible that sites that do best are made by web savvy people: they’ be good at building traffic with SEO etc. and may just happen to have a good domain name because they have read about the supposed characteristics of a good domain name. So in other words is it that a) being web savvy results in good traffic or b) good domain names result in good traffic? I think the domain name should be interesting and catchy. The length of the domain will not be a concern then. Don;t you think so? Really interesting finding, domain name are important but this include idea, creativity, effort and so much more work have to be done to make the website successful. Interesting article – I’m not sure what “camp” I fall in. Probably a little of both. Speaking real-world though, how can the average blogger take advantage of this? I’m certainly no expert on domain name construction or availability, but the general sense I get from experience is most short domains are already in use or too expensive to purchase. Those left are nonsensical, and I’m not sure anyone wants to come to http://www.xzlrt.com. On another note – was their no Friday Q&A post last week or did I just miss it somehow? @Sap abap, my prerogative is that if you have big plans for a website, you must spend money to buy a good domain for it. If you don’t have money to spend, I would say go with the best .com you can find. A nice post regarding domain names and the well known fact is all important key word domain names are all ready registered particularly with .com extension. Thus a new one will have only small choice with domain name like experimenting with a different name or choosing a different extension other than .com . Hmm – I wonder what will happen when “freestyle” extensions are affordable. You’d just search the name of the website you want (coz you can’t remember which extension to use) and then 500 results come up. Sometimes choice isn’t a good thing. @Paula, I never said that a competitor with a better domain will necessarily do better. All other variables being equal, though, he will. I personally don’t think that a competitor with a better domain name will necessarily do better. I agree that domain names are important but on the other hand I don’t think it is vital to ultimate success.